A cash-out refinance is a mortgage refinancing option of an existing loan where the new mortgage loan is for a larger amount than the existing loan. In this scheme, the borrower can get the difference between the old and the new loan. The main reason why homeowners turn to cash out refinancing is so that they can turn some of the built-up equity into cash. Here’s an illustration: Let’s say you have an original mortgage of $350,000 and now have a $250,000 balance. This means that your equity at this point is already $100,000 (or that’s how much of the house you actually own). Supposing you need some extra money of about $40,000. One way to get this is by a cash-out refinance. You simply get a new loan worth a total of $290,000 consisting of the following: $250,000 outstanding loan plus $40,000 that you want to take out in cash. Conventional Cash-out. This is available as a refinancing option for qualified homeowners who have built up more than 20% equity in their homes. FHA Cash-out. This cash-out refinancing option is available to homeowners with more than 15% equity in their homes. VA Cash-out. This cash-out refinancing option is available only to US veterans or active servicemembers and allows more equity from your loan. Essentially, in a traditional mortgage refinancing, the lender simply replaces your current loan with a new loan that carries a revised set of terms and, in most cases, a lower interest rate. There is no component that allows the borrower to take out cash from the loan as in the case of a cash-out refi. It’s also different from a home equity line of credit (HELOC), which basically uses your house as the collateral so you can borrow from it. HELOC is technically a second mortgage that allows a borrower to withdraw and repay funds on a convenient schedule. The government also allows a tax deduction for interest payments under HELOC. In HELOC, the interest rate varies from month to month depending on the prime rate and not fixed, in contrast to traditional first or second mortgages. Here’s the cool thing: you can use the cash for just about any need (or want) that you have. You can use it to pay high-interest credit as many people do. You would actually end up with the same total amount of debt you had when you applied for the refinancing but you would have effectively lowered your monthly interest payments. You also get the benefit of tax deductions because interest payments for refinancing are tax-deductible while payment for your credit card debt is not. In this kind of set-up, lenders will even be willing to pay your previous lenders directly at the time of your closing, saving you the time and hassle of doing it yourself. Some people use the cash for a major purchase or expense in instances when financing is not available or more expensive than the interest on a mortgage. For this situation, the lender may release the cash directly to the borrower so he can use it at his own disposition. You should avoid the mistake of using cash-out refinancing (or another long-term financing) to pay for current or short-term needs. Some people will use a cash-out refinancing to buy a car that has a six-year useful life. Yes, the interest rate is much lower than a car loan rate but instead of being fully-paid in five years, you could still be paying for another 25 years for an asset that you can’t use anymore. If you use cash-out refinance to payoff a credit card debt, you’ll have your credit line restored on the card but you still owe lenders the same total amount and at times a bit more if you finance your closing cost. There’s nothing perfect and in spite of cash-out refinance offers a lot of advantages, we should always consider the less attractive aspects. A mortgage refinance usually carries a lower interest rate than a home equity line of credit (HELOC) or a home equity loan (HEL). If you’ve bought your house during the times when interest rates were much higher, you might get a lower interest rate this time in a cash-out refinance. For instance, if you bought in the year 2000, the average mortgage rate was about 9%. Today, the rate is considerably lower than in 2000. However, if your aim is to only lock in on a lower rate and you don’t have a need for the extra cash, regular refinancing will take care of your need. If you’re saddled with high-interest debts like credit cards, using a cash-out for debt consolidation is a good move. It could potentially save you thousands of dollars in interest payment. If you pay off your credit card debts in full out of the proceeds of a cash-out refinance you would likely improve your credit score. What it does is that it reduces your credit utilization ratio which is highly dependent on the amount of credit you’re actually using. Credit card interests are not only burdensome but they offer no tax relief whatsoever. Mortgage interests are tax-deductible. This means that a cash-out refinance can bring your taxable income down and might give you a bigger tax refund. Don’t expect that the new mortgage provisions will be identical to the old one. You might have slightly different terms – or a lot. Just double check the fine prints and check your interest rate and corresponding fees before you sign your agreement to the new terms. If you are availing of a cash-out refinance to zero out your credit card debts, have the willpower not to run up your cards again. Remember, this will make your situation far worse than when you started. your home is the collateral, and therefore you may lose it if you can’t make the payments. You will have to pay closing costs for any refinance and cash-out refinance is no exception. Closing costs are quite substantial even if they typically just run to 3% to 6% of the mortgage because, in absolute amounts, that’s $6,000 to $10,000 for a $200,000 loan. Do some computations to make sure that your expenses do not negate the benefits you will derive from refinancing. Private mortgage insurance (PMI) is a requirement if you borrow more than 80% of your home’s value. For instance, if your home has a value of $300,000 with an existing mortgage of $150,000 but you want to avail of a cash-out refinance for $240,000, you’ll most likely need a PMI for the new mortgage. A PMI typically costs from 0.05% to 1% of your loan amount annually. So, using our scenario, a PMI on the new $240,000 loan would have a tag price of around $2,400 per year. By doing a cash-out refinance, you may be freeing yourself from credit card debt. Temporarily. The thing about restoring your 100% credit limit is that the temptation to use the card again without caution is too great. Just think of how miserable your life was during the time you were deep in debt so avoid getting caught into the same trap again. Should You Consider Cash-out Refinance? On the surface, using the equity in your home to get quick cash is a great idea but you have to make sure that this whole thing fits into your overall financial strategy. It is most crucial for you to know your general and specific financial goals and judge whether a cash-out refinance would hinder or help you to achieve them. For example, using a cash-out refinance to buy a LED video wall for your living room may not be worth the trouble paying for it for a long, long time. On the other hand, if you’re planning to use the cash to retire an onerous debt or finance an overdue home renovation, a cash-out refinance is worth considering. The monthly savings from a lower payment or the potential increase in your home value is a better trade-off for the extended repayment period. Is my home equity enough? Take note that there is such a thing as a loan-to-value (LTV) ratio for a cash-out mortgage and many factors affect it. It takes into account the occupancy status of your property (whether it’s owner-occupied or rented), the status of your credit, and what type of loan you chose (conventional, FHA or VA). The maximum LTV for conventional and FHA products range from 70%-85% but for a VA cash-out program, you may be able to stretch your LTV up to 100%. So, if you’re looking to choose a conventional or FHA cash-out refinance, you will have to build up more equity in your home. How will the cash-out refinance impact my monthly payments? To put it simply, a cash-out refinance will increase your total loan so you should expect your monthly payments to also increase accordingly. However, by extending the term of the cash-out refinance, you may be able to lower your monthly payments. 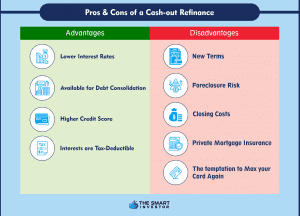 If you are using the cash-out refinance to pay-off a high balance, high-interest credit card, what you save on interest payments may help cushion the effects of a higher cash-out mortgage payment. Will this cause me to pay more money over the life of the loan? Most probably, you will have to shell out more money over the life of the new loan in a cash-out refinancing. If you’re already five years in your current 30-year loan and you decide to take out a refinance with a 30-year term, you will have to make bigger monthly payments because you are amortizing a bigger loan principal. Can I avail of cash-out refinancing for my FHA loan? If you have an FHA-insured mortgage, you may qualify and avail of FHA Cash-out Refinance. Keep in mind, however, that you will have to get a mortgage insurance so refinancing into a conventional loan might save you some money. What cash-out options are there for a US Veteran? If you are a US Veteran and has a mortgage guaranteed by the Department of Veterans Affairs, you may be eligible for a cash-out refinance. The better news is that they often come with great rates and allows you to borrow up to 100% of your home’s value. But, there’s more. Supposing that your original mortgage is not a VA loan but you have veteran or service member status or military family member status, then you may be eligible for VA Cash-out refinancing. Should you not qualify for a VA cash-out, you can always try for FHA or conventional cash-out refinancing. If you are looking for a more conservative means to get extra funds, you can explore other options. You can apply for a personal loan. You can go to your bank, credit union or online lenders to get a personal loan that will not require you to put up security beforehand. This way, you will avoid increasing your home-related debt. If you really have good credit, you can use credit card promotional offers to fund your small projects. The trick is to pay off the balance before the introductory period expires which normally lasts for a few months – otherwise, you’ll get stuck with astronomical financing charges. If you don’t want to replace your existing home loan, you can get a home equity loan or line of credit (HELOC) against your home. By doing so, you’ll leave your existing loan intact, including all the terms, interest rate, due dates, and your monthly payment. Your second mortgage may come with a variable interest rate but you don’t have to worry about it. Once you pay it off, you’ll just have to take care of your original loan – and you’re back to where you started from as if the second mortgage never took place. If you’re a homeowner over the age of 62, you have the option to take a reverse mortgage. This means taking a loan now, get the money in lump-sum or via monthly installments and paying off the loan later. You won’t have to make monthly payments for the loan but eventually, you will have to sell your house to pay off the loan when the last borrower moves out of it.